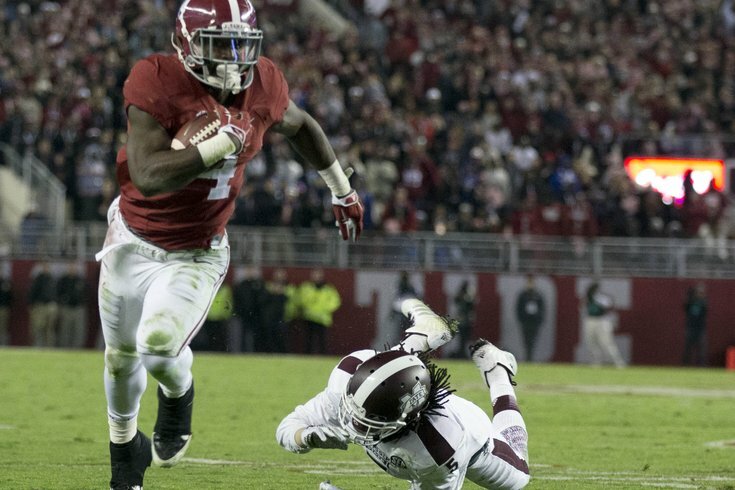 It will be interesting to see what TJ Yeldon runs in the 40 at 6'2, 220+ pounds. Abdullah has very impressive quickness and acceleration, which makes him a nightmare to tackle in space. He is also a skilled receiver out of the backfield. Abdullah was the most talented of the backs at the Senior Bowl, and is also regarded as a high character guy. In the game, Abdullah had 73 rushing yards and 40 receiving yards on 11 touches. Abdullah is going to destroy in his interviews. • Jay Ajayi, RB, Boise State (6'0, 221): As you can see above, Ajayi carried the load and then some for Boise, leading the nation with 347 carries. He was also fourth in the nation among running backs with 50 catches, and he was tied for first with 32 total touchdowns. • Javorius Allen, RB, USC (6'0, 221): Big back with Pac-12 roots, although he didn't play against Oregon in 2012 when Chip Kelly was still in #college. • Cameron Artis-Payne, RB, Auburn (5'10, 212): Artis-Payne had a strong showing in the Senor Bowl game itself, carrying the load on the opening drive. Artis-Payne had runs of 7, 3, 6, 3, 9, and then a reception for 24 yards. And that's kind of what he was for Auburn in 2014 -- a workhorse. He carried the ball 303 times (sixth in the nation), and had less than 20 carries in one game just twice in 13 games. One game was a blowout against San Jose St. in which he scored three times. The other was a game in which Auburn fell behind 21-0 in the first quarter to Mississippi State. Artis-Payne isn't flashy, but he'll run through tackles and could be a durable guy who can carry the load. • David Cobb, RB, Minnesota (5'11, 229): At Minnesota, Cobb was a tough runner with good size, at just hair under 230 pounds. I liked what I saw from Cobb at the Senior Bowl both as a pass catcher, and he was probably the best running back in pass protection, so he's a guy who can be a three-down player, a bonus in Chip Kelly's fast paced offense. Melvin Gordon wasn't the only 2000 yard rusher this year in college football. 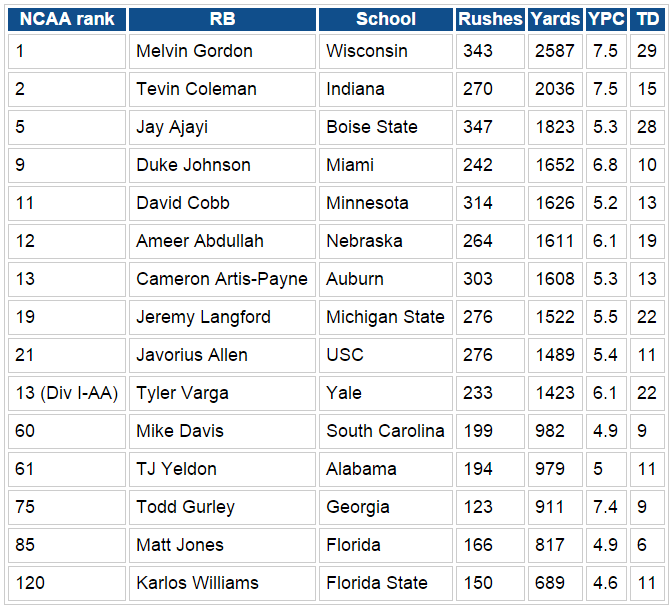 Indiana's Tevin Coleman also had a ridiculous season statistically, rushing for over 100 yards in all but one game. Coleman's situation at Indiana reminds me a little of Jordan Matthews' situation at Vanderbilt a year ago. Opposing defenses knew Vanderbilt was going to Matthews, because they didn't have anything else on their offense, and he still put up very impressive numbers. Similarly, opposing defenses knew that Coleman was Indiana's only real threat offensively, and they still couldn't stop him. • Mike Davis, RB, South Carolina (5'9, 217): Came into 2014 with high expectations, but production didn't match. Still, Davis is a thick back with skills who can be probably be had in the later rounds. • Melvin Gordon, RB, Wisconsin (6'1, 215): Let's just let Gordon's numbers do the talking for him: 343 rushes, 2587 yards, 7.5 YPC, 29 TDs, and a game against Nebraska in which he rushed for 408 yards on 25 carries. Likely the first RB to come off the board. • Todd Gurley, RB, Georgia (6'1, 222): Beast. If Gurley didn't tear his ACL in November, he'd probably be the first RB off the board. And he might anyway, depending on how his medicals check out. He is a no-nonsense, see-hole-hit-hole runner, who can also catch the ball out of the backfield (37-441-6 in 2013), return kicks (2 return TDs on 11 career kick returns), and is a good pass protector. Is Gurley is still sitting there in the first round when the Eagles are on the clock at 20, it wouldn't shock me in the slightest to see them pull the trigger. • Duke Johnson, RB, Miami (5'9, 207): Johnson has drawn comparisons to LeSean McCoy, which I can understand to some degree. Johnson is outstanding at "cutting on a dime" and changing directions like McCoy, but with less wiggle. He was also a productive as a receiver (38-421-3 in 2014) and he's a weapon as a kick returner (33 yard average and 2 TDs in 2012). • Matt Jones, RB, Florida (6'1, 231): Jones is a bigger back who can be had in the later rounds, and while his numbers aren't impressive, he was a player who looked good whenever I happened to catch him on TV. • Jeremy Langford, RB, Michigan State (6'0, 208): Nice showing at the Senior Bowl. Langford ran well, and he caught the ball better than I was expecting. Varga opened some eyes at the Senior Bowl. He's a hard runner who also played a little bit of fullback in Mobile. There may not have been a more jacked up player at the weigh-in. Varga is basically one 227 pound muscle. At Yale, Varga racked up 1423 yards and 22 TDs on 233 carries (6.1 YPC). Varga doesn't have good top-gear long speed, but he has good acceleration through the hole, and could be developed into a jack of all trades type of player. • Karlos Williams, RB, Florida State (6'1, 230): 4.6 yards per carry on 150 rushes in 2014, 8.0 yards per carry on 91 rushes in 2013. Low mileage, but what is he? Probably a late round pick. • TJ Yeldon, RB, Alabama (6'2, 226): Yeldon has a rare size-speed combo. It will be interesting to see what he runs at the combine at 6'2, 221. My bet is that he impresses. The biggest negative for Yeldon is that he's a fumbler. He fumbled three times his freshman season, five times as a sophomore, and twice as a junior. For his career, he has lost seven fumbles, and that's at a level of football where opposing defenses aren't quite as good at ripping the football out as they are in the NFL. That has to be a concern for a team that turned the ball over 36 times in 2014.